Is there a mineral collection lacking at least one spectacular calcite? I doubt it. After all, this lovely calcium carbonate is found all over the world; it is the most common carbonate. You are apt to run into calcite anywhere and in any environment. And when you do find a calcite, it might exhibit any one of more than 600 different crystal forms. When compared to other species, that is amazing! Within those 600 or so forms come some remarkable crystal twins that are exceptionally lovely. Add to that what seems to be an endless stream of oddly configured specimens that seem to have no internal structure and you have a single species worthy of its own museum! What other species forms bird’s nest specimens? What other species is found in straw-like tubes several feet long that actually grow from the inside out! What other species develops curls and loops and a host of weird shapes? Granted, a few other minerals may exhibit one of these oddities, but calcite takes the blue ribbon for odd! 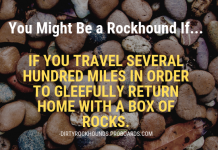 There are amazing worldwide deposits of the carbonate rocks limestone and dolomite, formed by earlier seas and oceans. No wonder Mother Nature has found countless ways to create crystal specimens of calcium carbonate, some of which challenge the imagination. 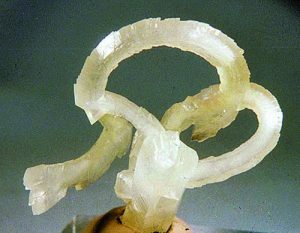 Calcite formed in limestone caves sometimes develops really weird shapes, like this twisting growth. Dripping waters in limestone caves can produce some creative formations, including what we call “bird’s nests”. Water that’s heavily charged with calcium carbonate drips to the floor of the cave, forming a shallow, bowl-shaped mass of calcite as the water evaporates. Any rock grains or bits of sand that end up in these shallow depressions get coated with calcite during evaporation. Layer upon layer of calcite coats the rock grain until it resembles a pearl or small egg in shape. In time, a large number of these masses form in the original bowl. Some call the rounded masses “cave pearls”. Others compare the pearl-containing calcite bowl to a bird’s nest containing small eggs. When caves contain pools of water, it is not unusual for calcite to form sheetlike extensions from the edge of the pond. If a sheet breaks loose and floats on the quiet water, calcite crystals can grow on the underside of the calcite “raft”, forming upside down specimens. There are calcite crystals that choose other species upon which to grow. Calcite overgrowths on other calcites or on quartz crystals are quite common. I suspect the electrical influences of quartz may attract molecules of calcite, which crown the quartz crystal. One explanation for finding calcite crystals just about anywhere is that it can develop in any environmental condition. If calcium-rich water is really cold, calcite can grow. As the temperature goes up, the crystals will still grow, but will take on a different shape! In a study done in Europe in the 1950s and reported in Ivan Kostov’s 1957 text Mineralogy, at temperatures around 25° Celsius, calcite tends to form in rhombs. As the temperature increases, assuming other conditions remain stable, the calcite form will shift toward scalenohedrons. Eventually, it will form lovely poker chip calcite forms. Another form of calcite is called “nail head” calcite. These develop when a single dog-tooth (scalenohedral) crystal is later capped by a crystal of calcite showing a modified rhombic form. These are decidedly fascinating. very structured crystals called twins. 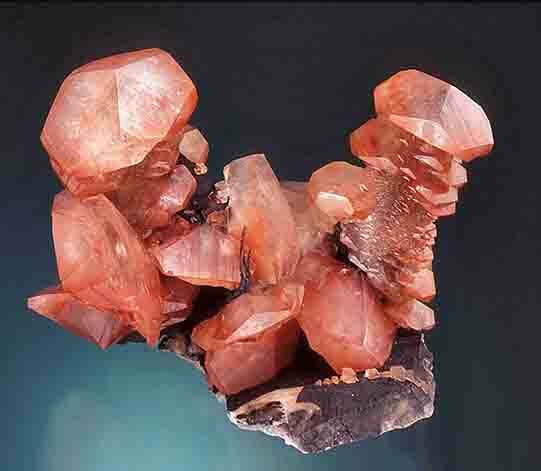 There are several types of calcite twins, all of which are very attractive. Twin formation is governed by set laws. During the crystal growth process, one or more molecules somehow offset when attaching to the normal atomic structure. This offset triggers a second crystal growth firmly attached to the first crystal. The two grow in unison, with the offset forming a very definite angle, which can be measured once the twins have developed. This angle is constant in all twins of calcite and follows the Law of Constancy of Angles. 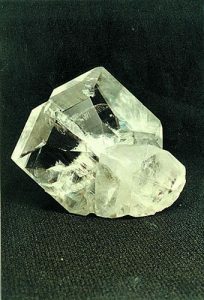 If a crystal resembles a twin, but does not have the proper angle, called a reentrant angle, it is not a twin. Quartz, in particular, grows in aggregates that look like, but are not, twins. So does calcite. 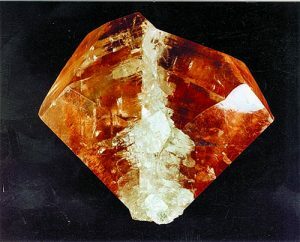 Twinned crystals are tightly bound, are generally equal in size, and share a common face. Most twins of calcite are contact twins, but some are penetration twins. My favorite calcite twin is what we affectionately call a “heart-shaped” twin. It is based on the simple contact twinning of two crystals, which forms a simple reentrant angle at the top of the twin, while sharing a common plane. The finest examples of this are somewhat bulging and are very three-dimensional, just like a heart. The finest examples have come, in past centuries, from England, and more recently, from China. Among the finest heart-shaped twins are those from the mines at Egremont (Frizington, Cumberland), England. These beauties are sometimes dusted with bright orange-red iron oxide, which enhances the “heart” association. Others are water-clear. You can follow the twinning plane from the base of the “V”-shaped reentrant angle down the center of the twin. These superb twins generally measure 3 to 4 inches across. They are almost never found on matrix. 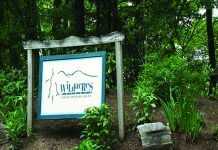 The better specimens from Egremont came to light in the 1800s, and the mine that produced them has long since been closed. Fortunately, fine heart-shaped calcite twins have recently appeared from China. Some are very flat, but the best specimens have that three-dimensional heart shape. These exceptional twins were found at Babu, near He Xian (Guangzi, Zhuangzu), South China. What is interesting about them is that some lack the bulging effect seen in the Egremont crystals. Classic heart-shaped calcite twins, often with a bulging shape, are sometimes colored by included reddish iron oxide or black or gray sulfide minerals. They are found in China today, and the original classics were found in England. This most unusual heart-shaped twin calcite exhibits wonderful zoning caused by included material. The most common twin form is a pair of crystals joined at the base that tend to be more or less flat which results in their nickname of “butterfly twins”, as they look very much like that insect with its wings spread. Most are water-clear and lack the multiple colors of the insect. Butterfly twins are found in a host of environments, but the best ones come from a Mexican locality high on the walls of Copper Canyon: the Porvenier mine. 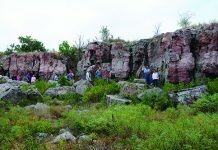 Flattened, heart-shaped twins, as well as twins that are shaped like an arrowhead, were common at this locality. In this country, one of the more popular calcite twins came from a quarry in Jennings County, Illinois. The twins are never very large, seldom exceeding 2 inches across. But their lovely honey color makes them attractive. 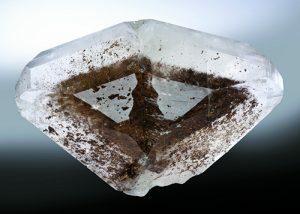 Each crystal is extremely rounded, so the re-entrant angle is very obvious. Some calcite twins attach base to base so their “C” axes align in opposite directions and their pointed terminations extend in opposite directions. When the “C” axes of such twins offset slightly, the result is a recognizable, very shallow, nearly flattened “V” reentrant angle, proof the crystals are twinned. These twins were found in some quantity in the Tri-State district of Missouri, Kansas and Oklahoma, along with galena and fluorite. More recently, the very important specimen locality at Elmwood, Tennessee, has produced remarkable specimens of twinned calcite, some almost perfectly aligned base to base, while others are set at angles ranging from 10° to 20°. The color of these spectacular twins is generally yellow to honey-colored to nearly orange, and some of them are quite richly hued. Unfortunately, in strong sunlight the fine color of these calcites tends to fade. Many of these crystals are gemmy. 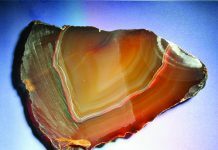 They are frequently found in amazing sizes; one specimen miner reported that he actually was able to slide down the face of a huge calcite crystal from one tunnel level into a crystal pocket a few feet lower. The quantity of calcites from the Tri-State district was exceptional. There were also superb examples of white barite, and simple fluorite cubes 4 and 5 inches on an edge. Many of the fluorites are also gemmy and have been faceted, producing gems weighing tens of carats. One of the forms of calcite mistakenly assumed to be a twin is characterized by two crystals stacked one on the other, like so many logs in a pile. They are, however, simply an aggregate of individual crystals, since they do not share a common axis or common prism faces. However, stacked calcites should be carefully examined, since some twins are formed when two crystals grow in parallel, sharing a common face. The equal, or nearly equal, length of the crystals is another indication of their common boundary and growth. Twinned crystals from San Luis Potosi, Mexico, are commonly referred to as “poker chip” calcites, since the mineral forms flattened, disk-shaped crystals that stack one upon another. This type of calcite was found abundantly at Charcas, San Luis Potosi, with disks that ranged from under an inch across to over 4 inches across. Similar poker chip calcites had been found in Germany a century ago, and currently, a few specimens are coming from Dal’negorsk, Russia, and from China. China has been quite fruitful when it comes to twinned calcite. The privately owned Leiping non-ferous metal mine (Guiyang County, Hunan Province, South China) has been especially productive. The Leiping calcites represent another form of twinning: two dog-tooth crystals retaining their original tapered shape, but at a set angle of 45°. They are found in tight clusters on large plates, with and on myriad single dog-tooth crystals. butterfly form. Some even approach the heart-shaped form. Others are simple, free-standing, flat crystal twins, while others are made up of crystals that are nearly square in twinned form. What sets these specimens aside from most others is the light to heavy dusting of iron oxide on all the crystals, including the twins. Quantities of these very attractive calcites were mined at Leiping before 2006. This is just a glimpse into the remarkably varied world of calcite crystals and forms. While ordinary calcite crystals may not command high prices, the odd and twinned specimens of the fifth most common mineral on Earth are surely worth considering for your collection, regardless of their cost.